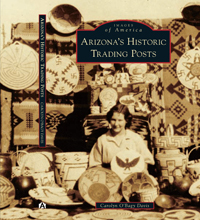 On the sparsely settled Arizona reservation lands, trading posts were important centers for commerce, as well as social gathering centers. With a subsistence economy, the posts offered opportunities to trade sheep, wool, and crafts for necessities such as flour, coffee, sugar (known as "sweet-salt"), and tools. Most often, traders were Anglos, living as partners among their Indian neighbors. They often were the only contact with the outside culture, and their stores provided an outlet for local arts such as rugs, pottery, baskets, and jewelry. Traders helped with correspondence, transportation, sickness, and they even buried the dead. Trading posts were the sites of marriages and murders, they were destinations for artists, scientists, and adventurous tourists. 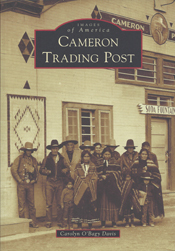 With the coming of roads and automobiles, trading posts have all but disappeared, but the stories and photographs shared in this volume give a glimpse into a vanishing time in the Southwest. 120 pages, $24.95, Purchase: click for the Book Order Form. 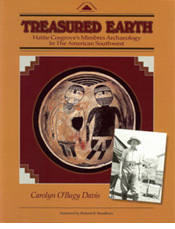 Desert Trader was named as one of the Best of the Southwest Books 2012. Goldie Tracy Richmond, 1896-1972, came to the southern Arizona desert in 1927 where she and her husband prospected for gold and ran traplines; and when a bobcat attacked her husband, Goldie strangled it with her bare hands. At 6'4" and 345 pounds, Goldie was a big woman with an even bigger heart--through her generosity and compassion she became known as the Angel of the Desert. 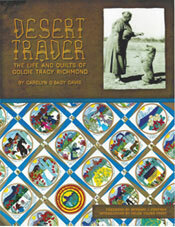 Goldie lived in a remote spot in the desert for 40 years where she operated Tracy's Trading Post, learned the Tohono O'odham language, and earned a reputation as the most respected trader on the reservation. Goldie also made original applique quilts depicting scenes of daily life of her O'odham neighbors and the Sonoran Desert. Stories of Goldie's life have become Arizona legends. In 1927 a New England family of five embarked upon a remarkable nine-month journey across America by automobile. Along the way, Maud Melville kept a journal, and her husband, Carey, took hundreds of photographs. The Melvilles also formed lasting friendships with several people they met on the Hopi Mesas of northern Arizona, and Maud began a long exchange of letters and gifts with Ethel Muchvo, a Hopi potter, and her family. This book tells the story of that friendship. 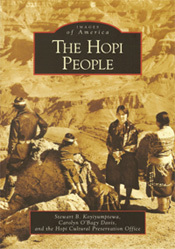 Hopi Summer is the winner of One Book Arizona 2011. Quietly heroic and deeply devout, Julia Abegg Call was the fourth wife in a polygamous marriage to Anson Bowen Call, Mormon Bishop of Colonia Dublan in revolutionary-era Mexico. Julia's story offers an intimate look into a polygamous family that struggled to stay together amidst political turmoil in Mexico, and the growing intolerance toward polygamy in the United States. Julia became the mother of twelve children and confronted danger, poverty, prejudice, and personal tragedy as the Call family found themselves in the middle of warring parties during the Mexican Revolution, crossing paths with both Pancho Villa and General John Pershing. The Fourth Wife has been nominated for an Evans Biography Award. Silver City is located at the southern boundary of the vast Gila Wilderness in southwestern New Mexico. Ancient ruins give evidence of prehistoric occupation, followed by a historic parade of Native Americans, Spaniards, Mexicans, miners, and outlaws. 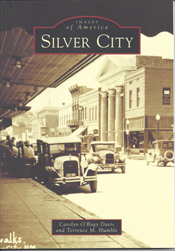 Some notable characters who lived in Silver City include the famous outlaw Billy the Kid, astronaut Harrison "Jack" Schmidt, and Baseball Hall of Fame member Ralph Kiner. When silver was discovered in 1870 at La Cienega de San Vicente, prospectors rushed in despite the danger from Apache Indians who traditionally occupied that land. Newcomers flooded into southwestern New Mexico Territory, and Silver City became the county seat the following year. Soon there were businesses, saloons, and homes. Silver City became the supply center for the widespread mining district, and in 1883, a narrow-gauge railroad connected the town with the outside world. The diverse people of the Hopi, whose name means "the peaceful ones," are today united on the Hopi Reservation, which is composed of 12 villages on more than 2,500 square miles in northeastern Arizona. The village of Orayvi on Third Mesa is considered the oldest continuously inhabited settlement in the United States, dating back more than a millennium. Often referred to as a "corn culture," the Hopis have developed dry-farming techniques that have sustained them in the harsh, arid landscape, where annual precipitation is often only 12 inches or less. The Hopi people are hardworking and spiritual, and their lifestyle has survived for centuries, only minimally changed by influences from the outside world. Through the collection of remarkable photographs gathered here, the reader will experience a rare glimpse into this unique culture. 63 color images and 80 B/W photos, 128 pages, $24.95, Purchase: click for the Book Order Form. Hopi Quilting tells the story of the introduction of quilting to the Hopi people of northeastern Arizona in the late 1880s, and of the long tradition of quiltmaking on the Hopi Mesas. Hopi women today are third-and fourth-generation quilters. Quilts have become closely woven into the fabric of daily and ceremonial life in all Hopi villages. Quilts are integral in the beautiful, dawn Baby Naming Ceremony, they are traditional gifts at graduations and when family members go off to school or to serve in the military, and quilts serve as burial shrouds at the end of life. 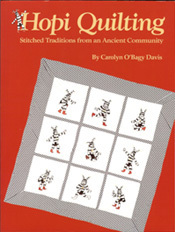 The blending of traditional Anglo patterns with Hopi imagery has resulted in a quilting tradition that is a unique legacy of an enduring culture. Purchase: click for the Book Order Form. Robert Nelson "Nat" Straw, 1856-1941, came to the Southwest in the 1870s. He worked on cattle drives, prospected for gold, and lived for a time with the Navajos. But most of Nat's solitary life was spent in the Mogollon Mountains, where he slept under the stars and walked the trails of the Gila Wilderness, hunting bears and wolves for the ranches in southwestern New Mexico. 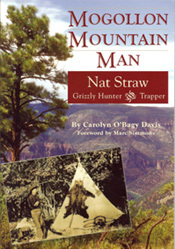 It was said that he could shoot the eye out of a grizzly at two hundred yards, and while his hunting skills were undisputable, Nat's amazing tales of bears and mountain lions have made him a western legend. His grizzly stories are still told around campfires in the deep canyons and high mountain meadows of the Gila Wilderness country where Nat Straw spent nearly six decades of his life. In December 1910, Indian traders Louisa and John Wetherill opened their trading post-with a tent for supplies (and sleeping) and a store counter of boards laid across two barrels. From that modest beginning, Kayenta became the center of Navajo gatherings and exploring expeditions to Rainbow Bridge, Monument Valley, and the grand cliff dwellings in Tsegi Canyon. 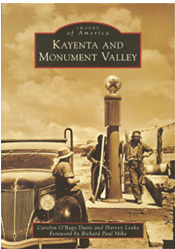 Soon came a parade of visitors, including authors such as Zane Grey, artists, Maynard Dixon, Jimmy Swinnerton, and W.R. Leigh to name a few, and archaeologists, as well as cowboys, miners, traders, and tourists. Even the lost and legendary Everett Ruess spent time with the Wetherills in Kayenta. Today Kayenta Township is home to descendants of the early inhabitants and the hub for thousands of annual visitors from around the world who come to see the magnificent region known as Monument Valley. Hattie S. Cosgrove was a hardware store heiress who came to the Southwest in 1907. In the southwestern corner of New Mexico she fell in love with the vast and wild Gila River country and soon discovered the ruins and traces of the long-vanished Mimbres Indians. She began to dig in the abandoned villages for the beautiful painted bowls that depicted intricate geometric designs and naturalistic images of people, animals, fish, and insects. But Hattie soon realized that digging only for treasures would destroy the fast-disappearing remains of the Mimbres Culture. She developed precise and scientific methods for recording her excavations, and her careful work led to a career as an archaeologist for Harvard University. Hattie's work in the Southwest and her haunting and beautiful drawings of Mimbres black-on-white bowls are a remarkable legacy of a vanished culture and an extraordinary woman, archaeologist, and artist. Ida Chambers Melugin documented her life through her daily journal entries, and the consuming interest of her life was making quilts. Ida's diaries tell of piecing, marking, and stitching quilts, of going to town to buy fabric and "batten," of putting quilts on the frame, and of the exact time of day when the last quilting stitches were made. 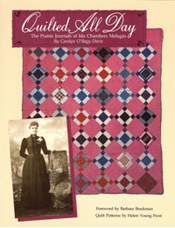 Quilted All Day is the product of years of research to locate diaries and information, of thousands of miles traveled to document Ida's life and her quilts. 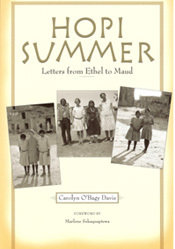 In these pages, Ida's devotion to her family and her friends, her caring nature, and above all, her passion for quiltmaking, is portrayed in a lifetime of letters and journals. Hers was an ordinary life, but her loves and sorrows, her intrinsic goodness, and her unceasing work to create beauty with her quilting, transcends the boundaries of time and speaks to us of the everyday life of a remarkable, prairie woman. Ida's life is a story told with fabric and a pen, her diaries and letters weave a tale that will be enjoyed by everyone who has ever touched a quilt and wondered about the life and times of its maker. 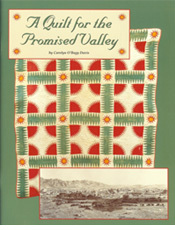 A Quilt for the Promised Valley, a sequel to Pioneer Quiltmaker, is the story of the creation and travels of a remarkable quilt. 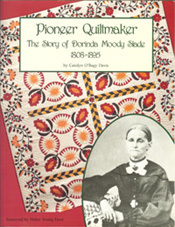 Dorinda Moody Slade, a Utah pioneer, stitched the Sunrise in the Pines Quilt as a wedding gift for her brother's marriage to his fourth wife in 1866. The pattern, which has interesting historical and political origins, is complicated and demands advanced stitching and design skills. Dorinda's quilt has additional unique and exacting variations. 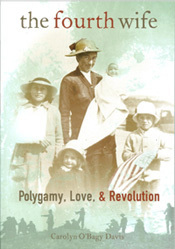 A Quilt for the Promised Valley explores the role of polygamy among Utah pioneers and its impact on Dorinda Moody, her brothers, and their families. The Sunrise in the Pines Quilt was eventually carried to distant outposts of the Mormon empire and beyond. Over the decades since its creation the quilt has brought joy and beauty to many, and survives as a legacy of humble faith and a pioneer woman's remarkable artist talent. Pioneer Quiltmaker is the culmination of years of research that began with an obscure reference to a Mormon pioneer who, during the Columbian Exposition of 1893, won recognition for her quiltmaking. The story of Dorinda Moody Slade unfolds as that of a fiercely independent woman's quest for creative expression and freedom of religious belief. Dorinda's journey through life is illustrated through her quilts, which reflect the hardships, sorrows, and simplicity of life on the American frontier. Dorinda and the story of her quilts are truly a pioneer legacy that will capture the hearts and admiration of future generations.